The TV Series Defiance: trailer, clips, photos, soundtrack, news and much more! There’s an extremely powerful sentient computer that intends to destroy the planet. Well, am not that worried, I know Nolan will save the day! Do you think Defiance will get a Season 3? Is it something you really wish? Are you hoping for the show to end with the season 2 finale? Share your thoughts below! There’s so much going on in this new season! I love it! The previous episode was really great an revealed much. Let’s hope this new episode will keep the pace! Do you like the TV series Defiance? Why? Am really sad for Amanda, she fell so low… she’s become a junkie! Am really glad Joshua and Amanda had some quality time together in the previous episode! 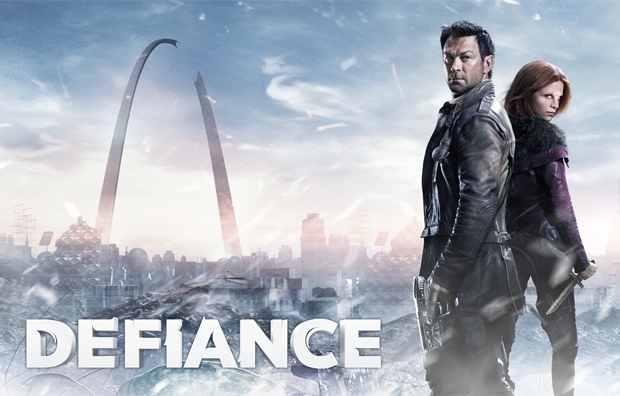 The new episode of Defiance will air on Thursday July 03rd, 2014. Am really glad the TV Defiance is back on air! And I totally approve Stahma’s emancipation! She’s a beautiful alien, isn’t she? The first season left us on a damn cliffhanger. Can’t wait to see the second season of Defiance! And God knows I miss Actress Jaime Murray as Stahma Tarr: the sooner she gets back on screen the better! Defiance will return on June 2014 on SyFy. Don’t miss the season finale of Defiance! Do you think there will be some romance between Nolan and Amanda one day? Datak should focus on his beautiful wife instead of his mafia business! Let’s hope Amanda (Julie Benz) won’t die from the plague! Who’s your favorite character in the TV series Defiance? Is the astronaut crazy? Or possessed by alien nanites? This new episode of Defiance is scheduled to air on June 10th, 2013 on Syfy. Defiance is going mystical with Irisa and her visions… Come on it’s a science-fiction TV series, not a fantasy show for God’s sake! What’s next? The Messiah or the Antichrist? Don’t really understand why those people and those aliens keep living like slum dwellers, but the show is still a good watch! The show has a few weaknesses, but it is still quite entertaining to watch. What about you? Do you dig Defiance? Am not sure yet I like this TV show, but well, at least SyFy is trying to live up to its own name for once by airing real science-fiction instead of dumb reality shows!